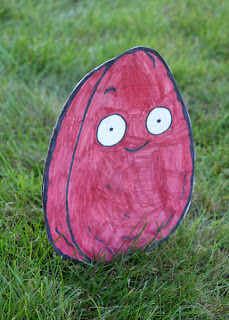 I wanted to post a couple of photos of our Halloween antics for you, because I'd mentioned plans to make costumes that the kids had requested and also I wanted to show you the decorations they helped to make for the front yard. I think maybe I'm an unorganised blogger, because often our seasonal projects are very last minute and I don't get to post about them until after the holiday is over, so too late for readers to really do anything with the idea other than bookmark it for next year if they like it, but in my defence, I do try and do a round up of previous year's antics before the holiday, so I'll likely mention anything we did this year for Halloween, just before Halloween 2012. We were so last minute with our yard decorating that it got done on the afternoon of Halloween itself. We enjoyed the frantic putting it together though and the girls thought it was really funny. 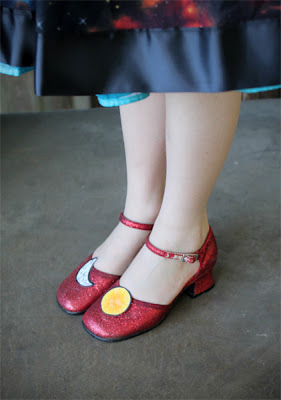 Kiddo wore a tutu under the dress to make it nice and full and we glued a sun and moon cardboard decoration to her dress up shoes. The finishing touch was just luck really. The local thrift store happened to have a really ratty looking auburn wig for $2, but after a bit of a clean and brush I was able to tie it back into a Ms Frizzle style hairdo and her costume was complete. It nearly didn't work at all when I realised that I hadn't taken into account if the dress would actually fit over her head with the buttons undone, but a tab of velcro on the front placket of the dress fixed that. Phew. I mentioned a couple of posts ago that Ffion had decided to be Rapunzel, which was really easy because there was a princess dress at the same thrift store that we got the wig from for just $3, so all I had to do was shorten it a bit and make her a fake frying pan out of foam sheets from some of computer packaging and a roll of black craft from from the dollar tree. Yay hot glue funtime! 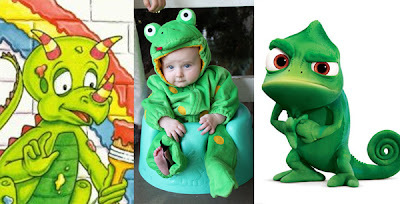 I also talked about the idea of dressing Delyth up as a lizard to be either Pascal to Ffion's Rapunzel, or Liz to Carys's Ms Frizzle, and a couple of readers gave some excellent suggestions as to how we could pull that off, but, well, we saw a frog costume at the thrift store and it was very cute and snuggly and only $3, so we figured it was close enough and she was lovely and cosy in it while we trick or treated. The thank you cards that we made from Carys's drawing were a big hit with our neighbours and Carys did enjoy giving them out almost as much as she enjoyed the candy that they gave her, so we'll definitely be doing that again next year! Now for the last minute yard decorating. 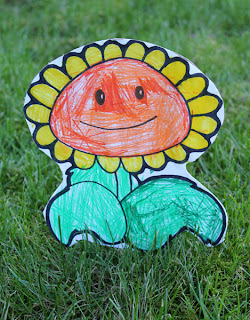 My kids caught the bug for the game "Plants vs Zombies" from some friends of theirs a while ago. They dont' really do much in the way of computer games, but this one really caught their attention and I kind of like it because it's funny and silly but does involve a bit of strategy and a bit of math. 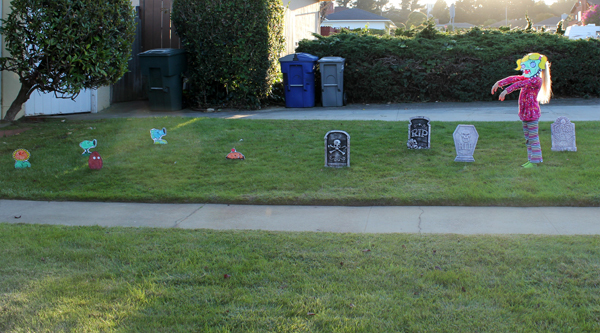 Our front yard is in a similar style to the one in the game, so for Halloween the kids wanted to decorate it with the plants and gravestones from the game. I just grabbed a few of the polystyrene gravestones from the dollar store to use and then I drew out some of the plants and the kids coloured them in. We taped a BBQ skewer to the back of each one to stand it up in the lawn. Last touch was a zombie mask that Ffion was insistant must be a girl zombie, so she could reinact the game. I'd love to have gone all out with this and made more masks and more plants and maybe even a cut out of Crazy Dave to go on our porch, but we just had enough time to get those few bits done and that was enough to please the kids. By the time we were done with all the sewing and chopping up paper and cardboard, the kitchen looked like someone had thrown a grenade onto the set of Project Runway, but it all worked out in the end. I've been pretty lucky so far with the kid's requests for Halloween costumes. The last two years only one kid has asked for a costume that you can't find an approximation of at a thrift store. Last year Carys wanted to be Darth Vader, which was great because a mate of mine had a costume from her son and it was Ffion that needed the custom approach because she was hell bent on being Cindy Lauper from the music video of "Hey Now". Given my habit of leaving everything until the last minute, I'll be in big trouble if they ever decide to both ask for something awkward one year. I know I'm not the only one that gets unusual requests for Halloween costumes, because this year a reader wrote to me about her son wanting to dress up as a chair. Hooray for kids with oodles of imagination! Have any of you had to accomodate unorthodox costume requests? I'd love to hear about them if you have. Hope you all had a lovely Halloween! Awesome!!! And how big Delyth has got, ohmygoodness. I love your Ms. Frizzle get-up! I knew it was her as soon as I saw the photo. Brilliant. My son wanted to be a house this year, and I was working on that but then he got a spiderman costume from DH's cousins and was happy with that, so we let him go that way. 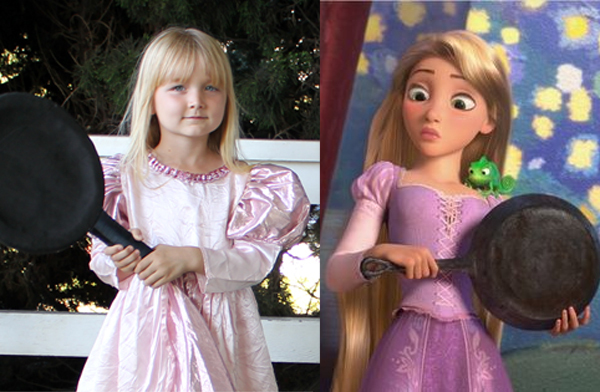 And my 2yo refused to dress-up at all, saying she was going as herself. Maybe next year! AWESOME COSTUMES!!! this year my 4 year old was Doctor Horrible, and so I sewed it all and was very pleased that my 2 year old was Wolverine, which we already had. Last year though, Landon insisted he needed to be a Transformer, but one that actually transforms (http://www.youtube.com/watch?v=bYE9Xh0p8z0 Like this). a week before Halloween. Wow! Those came out great. If my kid ever wanted to be Mz. 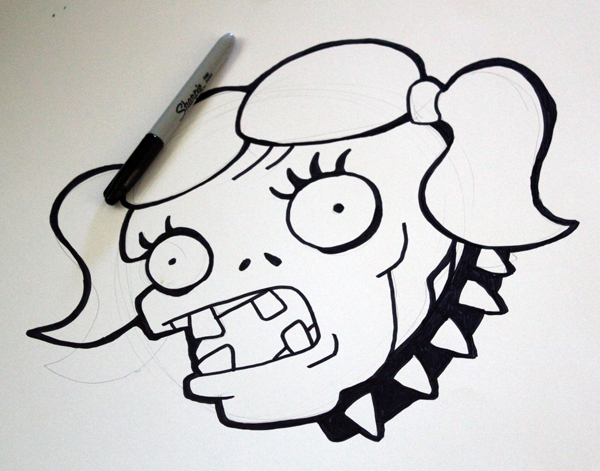 Frizzle, nobody would have a clue about who she was, but your costume definitely caught the essence of Frizzle! Those costumes are wonderful, and I love the P vs Z lawn decorations. I remember you said you sew by hand. Did you make the dress by hand as well? 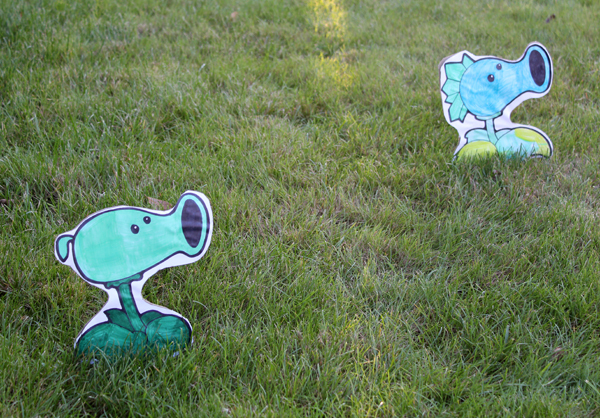 I love your plants vs. zombies yard! Your little zombie is adorable acting it out :) Your kids are lucky to have a mom who will follow their lead on costumes. 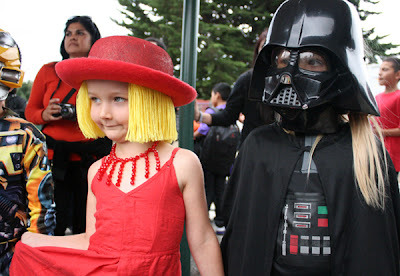 Love that Ms. Frizzle costume! Last year, he was The Ocean... Sand colored pants with sea plants cut from sticky felt and applied to the pant legs... A blue shirt, painted with lighter streaks to simulate rays of light, plastic fish and other ocean flor and fauna hot glued to the shirt... Oh, and you'd be surprised how well dots of hot glue look like bubbles!!! 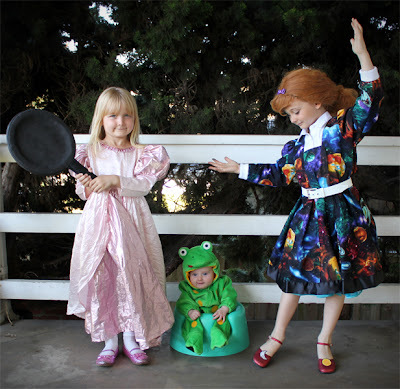 I ADORE that she wanted the frying pan!!! As an elementary school teacher, I LOVE that Carys was Ms. Frizzle!! So cute. Ffion was adorable as Rapunzel and Delyth was a precious lizard. Well done! We had a police car and a "blue monster" this year, both of which were unbuyable (or maybe I didn't look because we wanted to make them, take your pick). Oh, and Sarakenobi, I feel your pain. My 3 1/2 year old son was disappointed that his VERY ELABORATE police car costume didn't actually drive. Also I clicked on the link to the game... and have spent the last 30mins planting and blowing up zombies!! Never knew this game exhisted - but I am sure my 7 and 5yr olds will love it! My nephew wanted to be Sponge Bob (SB) for Halloween, but to upcycle and be more creative I talked him into being a SB birthday party. I made his front a table-top with a slice of cake on a paper plate, a plastic fork, table cloth, stack of gifts (empty food boxes wrapped with coloring pages) and a drinking cup with straw and paper soda with cardboard ice cubes. The back pannel was a ladder-back chair from cardboard and covered with white duct tape. Balloons tiede on the top knob. And, a paper hat made from coloring pages found online and an empty vanilla wafer box. He LOVED it and everyone asked him what store it came from. Ahahahaha! This is why I love this blog-your ideas are so unique and great...Plants Vs Zombies Halloween decorations! Ha! 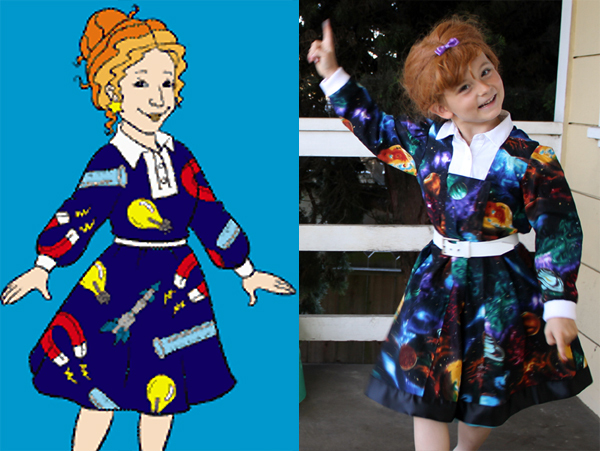 That Ms. Frizzle costume is my favorite I've seen this year. So great! We cut holes in a cardboard box for head and arms. Duct taped soda cans to the top on either side of the head hole. Took it outside for thorough black spray painting. When it was dry we added lettering LEGO. Son wore black hoodie and sweatpants and we blackened his face a bit. He was very pleased with himself!